StatMD supports our local schools to help them fund our young students of our future. 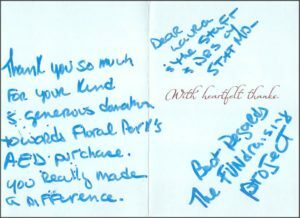 Floral Park thanks StatMD for gifting AED. StatMD has a partnership with the Sponsor A Highway® Program. Collaboratively, roadway will be cleaned, and of pounds of litter will be reduced, reused, and recycled into tons of collected waste. StatMD will continue to enhance its Corporate Social Responsibility making you a major leader in environmental awareness throughout the community in which our community work and live. StatMD will inspire other businesses and individuals to take on environmental initiatives to help.